Below are the instructions included with the Sterling 10.25 disc brake kit. This is for the Ford Sterling 10.25 full float single rear wheel (SRW) rear axle. These axles are great axles used in all Ford 3/4 and 1 ton trucks from 1985-97. There are two variations of the full float SRW axles. The 1985-92 and the 1993-97. The main difference is the pinion length. The 93-97 is the stronger axle. 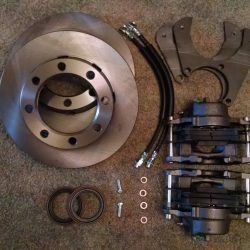 Sterling 10.25 disc brake packing list, basic instructions, and replacement parts list. If you bought this kit on eBay save money and buy from my website next time. Free shipping on my website. 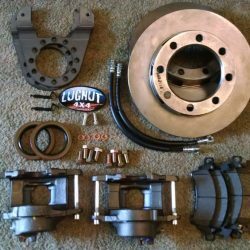 Below is a picture from a customer of the completed Ford Sterling 10.25 disc brake kit. Disassembly: Jack up the vehicle and place the rear axle on jack stands in a level area. Remove the wheels and tires. Remove the brake drums. There is nothing holding the drums on but rust. Use of a large hammer and great force may be required if the rust is bad. 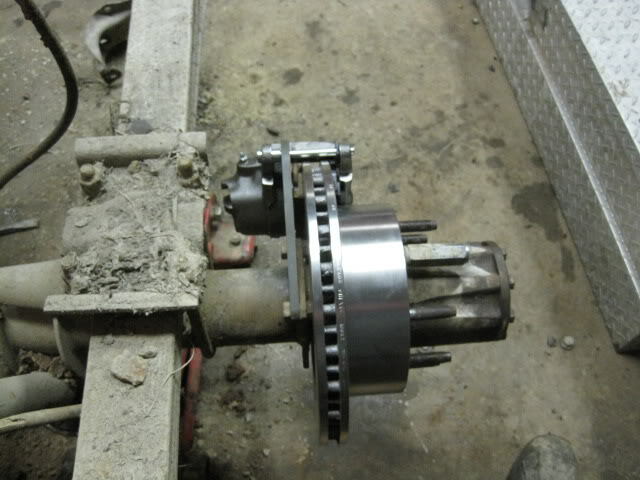 Next, place an oil catch can under the end of the axle shaft. Remove the 8 bolts that hold the axle shaft in. Hit the end of the axle shaft as if you were trying to drive it in. It will pop out when the right amount of force is used. Next you will need to remove the hub. You will need a special socket to remove the lock nut. The part number for this socket is W83008 and it can be found at most parts stores. On the socket I bought it would not fit inside the spindle. I had to remove the paint from the part of the socket that goes inside the spindle and even then it was very tight. On the driver’s side the threads for the locknut are backwards so turn it clockwise to loosen it. Once you have the locknut off the hub assembly will slide off. Disconnect the brake line and the emergency brake cable. Remove the backing place with the brake shoes. The only parts you will reuse are the hub, bearings, locknut, and axle shaft. Assembly: Install the bracket on the back side of the flange with the new nuts and bolts. Most people put the bracket to the rear of the vehicle so the two threaded holes in the end of the bracket are somewhat vertical. Do not use the lock washers. Put the bolts in from the bracket to the axle flange. Put the hub back on and tighten the lock nut to 55-65 lb-ft then backed off 5 clicks for new bearings or 8 teeth for used bearings. Slide the rotor on and put two lug nuts on to hold it in place. Measure the distance from the rotor to the bracket. The distance should be 3/4 to 7/8 inch. If the bracket is too close to the rotor install the lock washer as a spacer between the flange and the bracket. If the spacing is right, put the caliper on so the bleeder is up and install the axle shaft. Tighten the axle shaft retaining bolts to 60-80 lb-ft. Next install the brake hoses with the new stainless banjo bolts included in the bag of bolts. Put a copper washer on either side of the hose fitting on the banjo bolt. Cut the hard line on the axle and reflare it. Check to see if the fitting will thread into the hose first. If not you may need to get a new fitting. Your local parts store will have them. If they can’t find just the fitting buy the shortest 3/16 brake line and it will come with two fittings. When cutting the hard line allow enough length of the flex hose to take the caliper on and off to replace pads. Bleed the brakes and enjoy. Calipers: Standard calipers are 1980-86 Chevy K20 front with JB6. Emergency brake calipers are 1976-78 Cadillac Eldorado rear. Brake pads: For the standard calipers the part number for the brake pads should have D52 in it. For the emergency brake calipers it should have D122 in the part number. Do not use D52 pads on the emergency brake calipers. Rotors: The rotor is from a 1999 E350 rear or part number 54073. Hoses: The rubber hose fit 1980 Jeep CJ7 front. The braided stainless hoses are custom made. I operate an environmentally friendly company. We use solar energy for power and recycled packing materials. Even this paper is 100% post consumer recycled. The cardboard under the calipers is from incoming boxes. Packing paper is either old newspaper or reused packing paper from shipments we get. All peanuts are recycled also. Sometimes they look pretty rough, but every little bit helps to save the world for our kids. Thanks for your purchase of Sterling 10.25 disc brake kit!